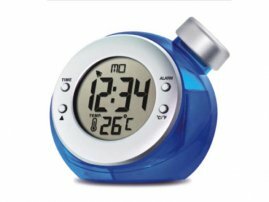 Water Powered LCD Alarm Clock with Thermometer / Calendar [GAD004549] : Onchee.com - the accessory shop for all your handheld Electronics! This Water-powered Digital Alarm Clock uses the latest long life HydroPower technology to power this large display clock Simply add water to the cell to activate, and enjoy free energy to run your clock. The clock has a built-in alarm and thermometer function, so it is ideal to wake you or remind you, as well as checking the temperature. You now have one more way to protect the environment! - Only add water into the thing will drive about 1 months. Never use lithium battery again, leave all the people a beautiful & clean earth. - Green, protect environment, water is the power. - The most cheap alarm clock cost: because you don't have to buy battery again and again. - When the letter on screen fade, means you have to change the water to gain new power.